Many of you are offering textured melamine and coming up with Fastcaps that are even a close match is difficult. Fastcap now stocks white, milk and dark chocolate caps. Fastcap has a program – you send them your edgebanding and they will make caps using your banding. This is a great way to get exact matches for you new textured colors. 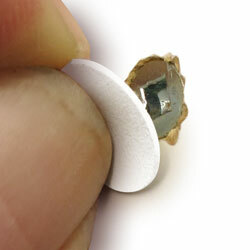 Are you using contact cement to apply edgebanding? Why? Because it’s what you have always done? How much time do you waste cleaning up the overspray? Fastcap has the solution… Its call Speedtape, it will save you time, energy and some aggravation. Speedtape is the heavy duty double sided tape that you find on the back of Fastcaps or rolls of Fastedge. That is why selling rolls of the adhesive separately is such a great idea! Speedtape comes in 50’ rolls and is available in four different heights so you will be sure to find one that works for you. Repairing a damaged vertical on-site or banding a corner shelf by hand was never so easy. Your turn, have you used Speedtape? Do you have any unique uses for Speedtape? Are there any reasons that you would prefer contact cement?